Sierra Club Books, 9781578050840, 312pp. 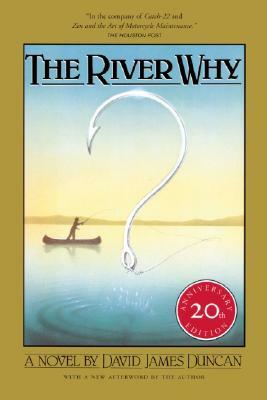 Since its publication by Sierra Club Books more than two decades ago, The River Why has become a classic, standing with Norman Maclean’s A River Runs Through It as our era’s most widely read fiction about fly-fishing. This captivating and exuberant tale is told by Gus Orviston, an irreverent young fly fisherman and one of the most appealing heroes in contemporary American fiction. Leaving behind a madcap, fishing-obsessed family, Gus decides to strike out on his own, taking refuge in a remote riverbank cabin to pursue his own fly-fishing passion with unrelenting zeal. But instead of finding fishing bliss, Gus becomes increasingly troubled by the degradation of the natural world around him and by the spiritual barrenness of his own life. His desolation drives him on a reluctant quest for self-discovery and meaningultimately fruitful beyond his wildest dreams. Stylistically adept and ambitious in scope, The River Why is a touching and powerful novel by an important voice in American fiction. In a new Afterword written for this twentieth-anniversary edition, David James Duncan reflects on the genesis of his book and on the surprising link between fishing and wisdom.